I am someone who often has my nose in a book. Not unusual, of course, for a writer. But in 2012 I decided to think about doing this quite literally when I collaborated with the Ceredigion Art Trail open studio event in west Wales. Every August, artists open their homes to members of the community for ten days, enabling the public to come and see what artists get up to the rest of the year. I decided to join in and offer my home as an exhibition space. Why would a writer do this? you might wonder. I find paint and canvasses mesmerising objects to live with, having inherited a few from my mother and grandmother and having grown up with several painters in the family. I loved the stories their paintings told through a swish of brushstrokes, and how movement and stillness were held in the same splash on canvas. As a young teenager, I wondered what would happen if I could turn the brush into a pen, step into the character in the painting and walk the bridges and hills in my mother’s, my grandmother’s and my aunt’s paintings. So, the Art Trail seemed the perfect opportunity to explore this. Not only did I exhibit artist Lilwen Lewis’s paintings side by side with my books, but I also experimented with hanging my books in front of Lilwen’s paintings, so that the viewer’s first experience of the painting was through the words of the poem at which the book was open. By enabling the viewer to arrive at the painting by way of the book, I began to reflect on how the boundary between artefact and word had become blurred for me, how word might be transformed into artefact. It took me back to some of my first experiences of writing: after visiting the Bronte Parsonage in Haworth as an eight year old, I made and wrote in tiny books, just like the ones I’d seen there. The act of writing on a page barely an inch square forced me to distil my thoughts to a handful of words. 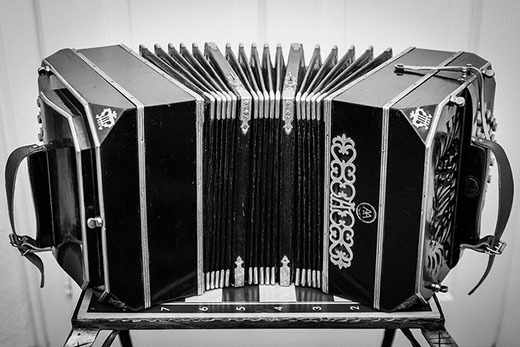 Folding and unfolding paper as a child to create those teeny books stayed with me, and when I started dancing Tango over ten years ago, it seemed to me that the bandoneon (a type of concertina, pictured above) was like a singing book: portable, with folding pages. It made me want to write on it, to challenge the way I compose my poems, to explore folding and unfolding narratives by writing on other materials which open and close: fans, skirts, parasols. I thought that one way of doing this would be to collaborate with visual artists, paper sculptors, tango dancers and an accordion player, so I started discussing my ideas last year with the Arts Council who encouraged me to apply for a Creative Wales Award. I was thrilled to hear recently that I am to be granted one of these awards, starting on 1 April. Who knows what will unfold from this period of experimentation? One thing is for sure: the Ceredigion open studio event next year is one I am particularly looking forward to, where art, dance, music and poetry will each contribute to my new performances.